It's no easy task to digest the goings on of the NBC late night war that was brought to a head this week. After the jump you'll find all the night by night highlights of the bitter goings-on. Friday it seemed like a joke. While everybody had something to say about the late night scuffle, it was just that; A passing wind that would quickly be forgotten. It was surely nothing more than a stupid press release from a stupid network that would quickly see the error in their ways, and relent to the demands of it's shrinking viewership. Conan, who had actually been struck harder than he could realize was still able to keep his satire biting and his finger pointing toward the self. While he made a few jabs at Leno and NBC during his monologue, it was his post monologue sketch that soothed us into believing that this would all blow over. It was still just a joke. On Tuesday Conan released a statement explaining that he would indeed be leaving NBC, citing many grievances, still taking the high road along with the low. His Deal or No Deal parody illustrated his ongoing refusal to take anything too seriously while performing for his viewers. Leno said little, and nothing worth mentioning. On the third day of battle Leno attempted once again to belittle the network that continues to bend over backwards for him, and tries his hardest not to make himself look like a villain. Conan continued riding the controversy wave, and his guest Ricky Gervais enjoyed the simple pleasures of being able to drop the F bomb without anyone getting upset. It's been reported that Conan's Tonight Show viewership hit an all time high last night, but it was during Jay Leno's show where Conan won his biggest victory and he wasn't even in attendance. To wrap up the week Jimmy Kimmel said everything everyone has been and is thinking, and Jay Leno couldn't say a word. So as for the battle, the win is Team Conan's, but the war trudges on. 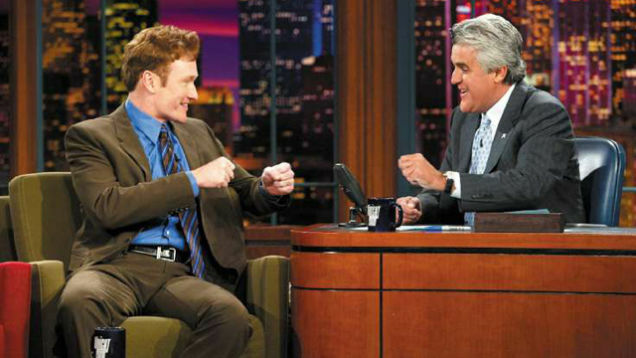 The week came to a close with Leno bashing Dave Letterman harder than Conan, and feeling sorry for himself. When 11:30 hit there was a kind of mania going on over at The Tonight Show set, as Conan attempted to sell his set in exchange for an elderly couple over Craigslist. He was then informed he was a pimp by one of his own writers, which just might have made him more comfortable discussing acid trips with Jeff "Lebowski" Bridges himself later on in the show.